OBRAS DE A. DE MUDARRA Y M. DE FUENLLANA. Tan que vivray, de Sermisy. Glosa sobre la misma canción, (Fuenllana). 4'16"
La Romanesca: o guárdame las vacas. (Mudarra). 1'46"
Fantasía de redobles. (Fuenllana). 1'26"
Duélete de mi, señora, de Juan Vázquez. (Fuenllana). 2'49"
Fantasía I. de passos desembueltos. (Mudarra). 1'32"
Fantasía que contrahaze la harpa en la manera de Ludovico. (Mudarra). 2'18"
Morenica, dame un beso, de Juan Vázquez. (Fuenllana). 1'26"
Tiento y fantasía de tercero tono. (Mudarra). 5'34"
Kirie de una missa de Josquín que va sobre pange lingua glosado. (Mudarra). 2'50"
Conde Claros en doze maneras. (Mudarra). 2'00"
Pavana de Alexandre y Gallarda. (Mudarra). 3'26"
De Antequera sale el moro, de Morales (Fuenllana). 2'36"
Fantasía II, de passos. (Mudarra). 1'31"
De los álamos vengo, de Juan Vázquez. (Fuenllana). Fantasía III, para desembolver las manos. (Mudarra). 1'23"
Torna Mingo a enamorarte, de Guerreros. (Fuenllana). 2'35"
Con que la lavare, de Juan Vázquez. (Fuenllana). 4'08"
Puse mis amores, de Ravaneda. (Fuenllana). 6'51"
Tiento y fantasía de octavo tono. (Mudarra). 3'21"
Fantasía de octavo tono. (Mudarra). 1'28"
Benedictus de la missa de Gaude Barbara, de Morales. (Fuenllana). 1'47"
Fantasía sobre fa, mi, re, ut. (Mudarra). 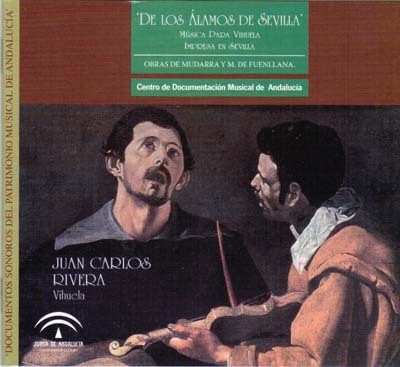 1'36"
Our knowledge of instrumental music in Spain or in Western Europe before the end of s. XV is very low for the simple reason that it is difficult for that type of music that we have arrived. All of that time there are some keyboard tabs Germany, England or Italy, but no music for other instruments. There to do a very simple explanation: that music was not written normally, or at least, if you used some kind of notation, this was basic, with mnemonics for, had written on slips of paper that have not withstood the over time. Only from the second half of the fifteenth century there is evidence of the emergence of different types of tablature, often highly experimental, lute and vihuela in Spain and elsewhere. The absence of written instrumental repertoire prior to 1500, while we see musicians of all kinds in paintings of the period, or reported in the literature and documented in the files, it may seem contradictory, but not surprising if we consider carefully the practical and instrumental tradition. First, the social status of professional musicians was very different in nature to that of professional singers also the organist. While the singers were used primarily by the Church or equivalent institutions, such as cutting chapels, for which required the acquisition of a relatively high level of writing music, the musicians provided musical entertainment, consisting most often in support of songs and dances, which was basically improvised. Normally, the musician chapel or cathedral had to be trained by the choirmaster to read music, or at least plainchant and polyphony to read and write which was composed for liturgical celebrations. For its part, the performer usually acquired their skills during a long apprenticeship, often with his father or another family member. Both the technical implementation and the repertoire, or how to improvise music accompaniment for dance and songs, thus passed from generation to generation without the existence of the urgent need therefore, to write music. However, towards the end of the fifteenth century there were two cultural phenomena which had far-reaching consequences for instrumental practice. The first is the invention of printing led in the early sixteenth century to the publication of the first volumes of lute music in tablature. The second, the increasing taste for musical composition, at first within court circles where they play a musical instrument was considered the true noble attribute, and later also among those rich enough to be given some free time.